Rugby Town ended their 2015 on a real high, with festive victories over Daventry and Basford on Boxing Day and Bank Holiday Monday respectively lifting them three further places in the Evostik NPL South. It also extended their winning run to three games in total and it is also just two defeats in eleven league outings for Dale Belford’s revitalised side now, and with a similarly good start to the New Year, a challenge for the play-off zone would not be out of the question. 14th placed Valley now have a further seven teams within three points of them in a tight divisional table, with 5th placed Lincoln then currently occupying the final play-off spot a point further on. There was Christmas cheer aplenty for Valley in their local derby last Saturday, when they romped to a 4-0 victory over the Communications Park outfit. Town had been bamboozled by the Daventry’s direct style of football and conducive conditions on five previous consecutive occasions, but this time it was more ‘hit-and-no-hope’ from the hosts, as Rugby finally made the short journey home across the county border brimming with pride. 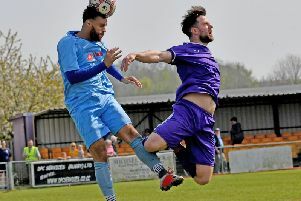 They followed this up with a further clean sheet in the single goal victory over another current play-off contender Basford on Monday, meaning they had doubled their clean sheet total (to four) in the league for the season to-date in just three days. Next-up is a trip to Staffordshire for the return fixture with Newcastle Town on Saturday, where Valley will be looking for their first double of the season on the back of a 2-1 victory over them in the home game in mid-November. A Callum Powell strike and a Kevin Thornton penalty secured the points at Butlin Road that day, with Thornton again successful from the spot in Monday’s win against Basford – on the back of a particularly impressive display at Daventry, where he chalked up three assists. David Kolodynski was twice on-target at Communications Park, as he celebrated his signing of a contract which will guarantee he stays at Town until the end of this season with the option of a further year extension. Kolodynski’s Boxing Day double takes his total to the season to seventeen – twelve of which have come in league games. He is now up to (joint) sixth in the South Division goalscoring chart – just three behind its leader - ex-Valley man Luke Keen. This Saturday’s opponents are one place and two points below Rugby in the standings, and had a mixed Christmas with a 2-1 Monday defeat at Kidsgrove preceded by a victory by the same scoreline against Leek on Boxing Day. Valley’s other scheduled matches in January see them face four teams all currently below them in table, including home fixtures against bottom two Loughborough and Tividale on the 9th and 23rd of January respectively. They then have a potentially tough February when they are due up against both of the current runaway top two Coalville and Stafford – with the latter having already established a nine point lead at the summit. # Tomorrow’s (Saturday, January 2) coach to Newcastle will leave the clubhouse at 11am. For latest information, contact Tony Mann on 07970 691366.